Men in skirts. Women playing guitars. You'll find all this and much, much more at Las Palmas de Gran Canaria's Pueblo Canario during your Gran Canaria holidays. Put on your dancing shoes as they positively encourage audience participation. 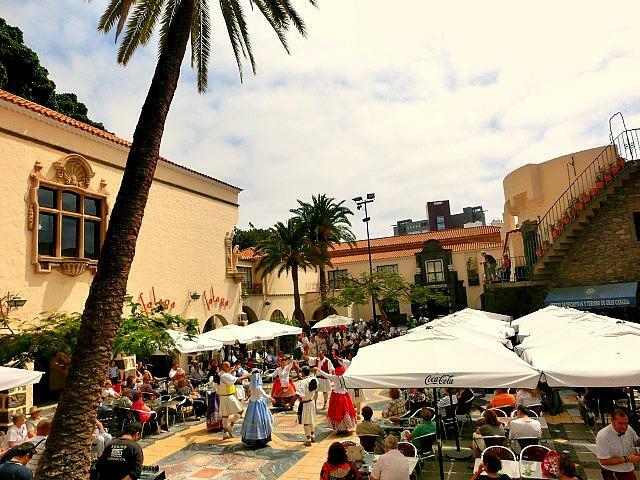 Pueblo Canario is the recreation of a Canarian village in the heart of Las Palmas de Gran Canaria. It borders Parque Doramas and is well worth a visit any time of the week. However, if you go on Thursday afternoons or Sunday mornings, you'll be able to watch a free concert of traditional Canarian folk music. Some songs will be instrumental; others will include singers. Whether they're musicians or dancers, who join in on some of the numbers, all members of the group are kitted out in authentic costumes which have been worn for generations. 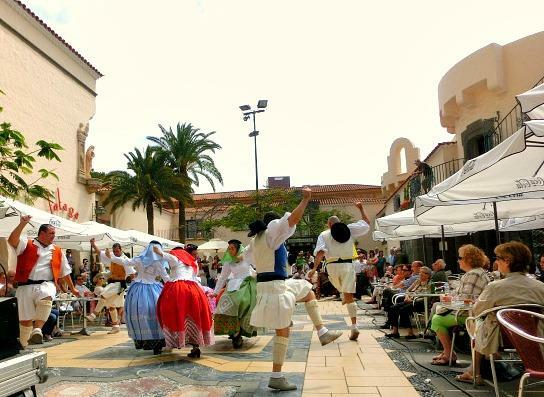 Somehow I can't imagine morris dancers in England pulling on a skirt as both the male and Canarian folk dancers do. 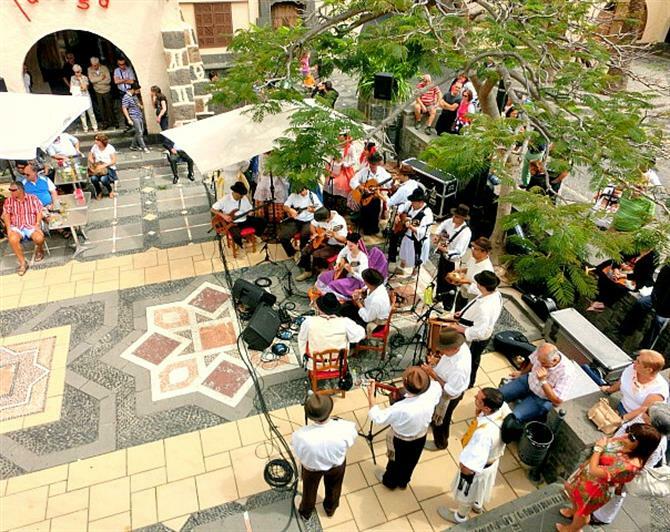 I've often walked through Pueblo Canario at the weekend, on my way to taking my two youngest boys to the Sunday show for kids in Parque Doramas. But today was different as we stopped to watch the Agrupación Folklórica San Cristóbal who celebrate their 50th anniversary in October. Despite playing a traditional set, they had members younger than me; teenagers who you'd think would be more into reggaeton than music where the timple, a pygmy guitar, plays an integral part. During the concert, women members of the group tour the tables of the Pueblo's Bodega where you can enjoy a beer or coffee. They're selling various CDs of the group in concert and studio. And on the day I visit, they're doing a roaring trade. Agrupación Folklórica San Cristóbal alternate at the Pueblo Canario with Agrupación Folclórica Roque Nublo. The latter recently entered the Guinness Book of World Records, for the longest performance of Canarian folk music ever. They encouraged spectators to dress in traditional Canarian costumes as part of the Fiestas Fundacionales, celebrating the anniversary of Las Palmas de Gran Canaria's foundation, which took place outside the cathedral in Plaza Santa Ana. Although it's not quite as popular on the Canary Islands as football, they do televise this Canarian form of line dancing. 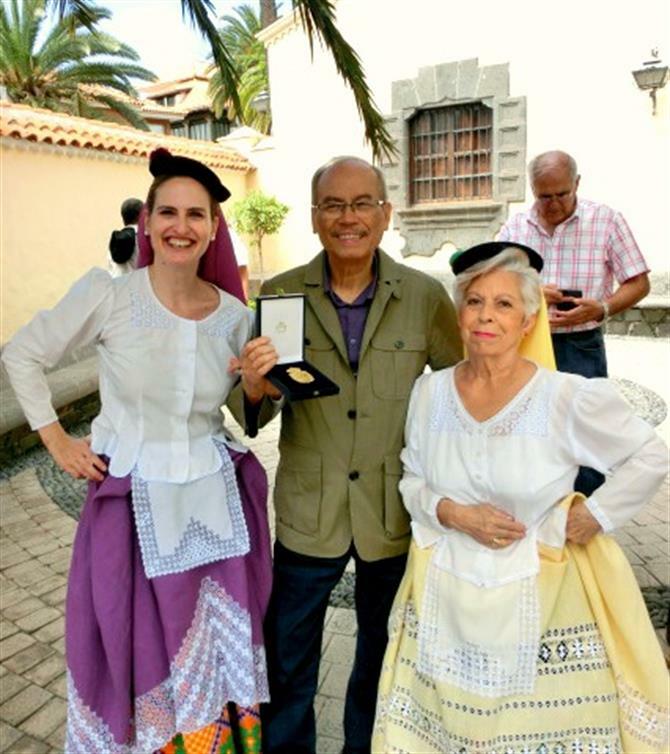 Tenderete, showcasing Canarian popular culture, has been on television screens for over 40 years. It goes out on La 1, every Saturday at 9:30pm.